The Mexican energy reform triggered the interest of an integrated energy services oil company for the early appraisal of several oil and gas blocks and facilities in Mexico. HSE International was appointed by the company to conduct the screening and preliminary environmental and social assessment of 4 blocks in Mexico, and to conduct a more detailed assessment of 2 of the blocks. The assessment included carrying out a desktop review of the oil and gas blocks and several associated assets and facilities, conducting field visits to the areas of interest to validate the information and fill information gaps, and conducting meetings and interviews with institutions and stakeholders to gage expectations, and assess compliance against good international industry practices, standards and national regulations. The outcome includes a better understanding for the management of the potential liabilities, risks and impacts associated with the investment. 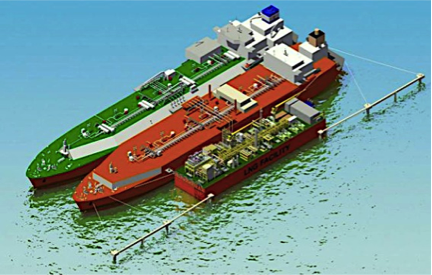 The project is the world’s first Floating LNG Liquefaction Regasification & Storage Unit (“FLRSU”), located on the Colombian Caribbean coast. The project includes an 88 km, 18” diameter pipeline from the producing gas field onshore Colombia. Commissioning is expected in 2015. As part of the project appraisal process, assessed the environmental, social, health and safety (ESHS) management system, plans and programs to be implemented for the project. The appraisal involved desktop review of the main ESHS risks and impacts of the proposed Project and its dedicated associated facilities; a site reconnaissance of the gas field, pipeline and marine area; and interviews and meetings with key Company personnel, affected communities, institutions and other stakeholders. The outcome includes identifying potential liabilities, risks and impacts, as well as recommendations and an action plan for risk management and to ensure compliance with the IFC Performance Standards, EHS guidelines, and good international industry practice (GIIP). HSE International was retained by the Client, a major international Company, to conduct an Environmental and Social Due Diligence (ESDD) of an industrial complex and associated facilities located in the State of Veracruz, Mexico. The ESDD was completed in support of a transaction for the acquisition of the facility. Additionally, HSEINTL incorporated relevant social aspects and conducted a limited review of environmental health and safety compliance. The HSE International team reviewed data room information, conducted a site visit / field inspection, and interviews with company personnel and stakeholders in Mexico City and at the industrial complex. A final report and presentation including findings, risk evaluation, potential liability, and recommendations were delivered to the company for a better understanding and due consideration of the environmental, health and safety risks that may translate into financial and reputational liabilities. The project consists of the financing agreement for up to $500 million, for the onshore and offshore operations of the Company, an independent oil and gas exploration company focused on the Middle East, North Africa, Mediterranean and Black Sea regions. As part of the project appraisal process, assessed the environmental, social, health and safety management system, Corporate Social Responsibility programs, environmental impact assessments (EIAs), HSE management plans, and other HSE initiatives of the Company. The appraisal included site visits to the operations of the Company in Egypt, and onshore and offshore Bulgaria (Black Sea) to assess the adequacy of implementation of the programs and management system, mitigation and monitoring measures; health and safety management practices and procedures; contingency/emergency planning procedures; and public consultation and community relation and participation activities. Interviews with company personnel and local stakeholders were conducted in those locations as well. Meetings were conducted in London with Company executive management to clarify any outstanding issues. The purpose of the assessment was to identify key ESHS liabilities, risks and impacts, gaps against IFC Performance Standards and good international industry practice, and opportunities for improvement. The outcome included a set of recommendations and an action plan to manage risks, and ensure compliance with the IFC Performance Standards, World Bank Group Environment, Health and Safety Guidelines, and good international industry practice (GIIP). The appraisal was conducted as part of the proposed equity investment of an AIM-listed oil and gas E&P Company, to finance the exploration and development of two concessions in a proven hydrocarbon system in Paraguay’s North West region of El Chaco. Based in the United Kingdom, the Company has oil and gas operations in the US, Argentina, Australia, and Paraguay. The purpose of the appraisal was to identify potential liabilities, risks and impacts, opportunities for performance improvement, gaps against standards and good international industry practices, and provide recommendations to manage risks and ensure compliance with IFC Performance Standards. The appraisal consisted of desktop review of project reports, followed by a site visit to the Paraguayan operations of the Company. Meetings with senior management and technical staff, Paraguayan government environmental and social institutions, external environmental consultants and contractors were held in Asunción and the project area. Meetings were held with stakeholders such as such as landowners, community authorities, representatives of NGOs, and indigenous communities in the Chaco area. Environmental and social risks and impacts were identified, assessed, and prioritized; and a project specific action plan delivered with measures to manage risks and mitigate impacts. HSE International provided oil and gas industry environmental, health and safety expertise to the independent consultant team engaged to conduct a Risk-Based Environmental and Social Review of the operations in Block 57, located in the Peruvian Amazon. Proven gas reserves from Block 57 were being offered as a guarantee of gas supply for the International Financial Institutions (IFI) financed Peru LNG Project. The project components included production facilities and operations, multiple flowlines / pipelines, 3D seismic operations, as well as a new development of a field expected to start operations in 2017. The assessment consisted on the review of the Health, Safety and Environmental (HSE) management system, Corporate Social Responsibility, and other programs and information, to identify risks or impacts (actual or potential) associated with the existing and planned operations. Interviews with company personnel and local stakeholders were conducted, as well as a site visit to assess the adequacy of implementation of the programs and management system, mitigation and monitoring measures; and public consultation and community relation and participation activities. IFI guidelines and ESHS Good International Industry Practices (GIIP) were used as a basis for the assessment. The risk assessment process involved identifying significant gaps with the IFI policies, standards and guidelines, and deviations from ESHS GIIP. Risks from identified gaps or deviations were assessed in terms of their potential consequences and the likelihood of occurrence. The context where the project is being developed, including other experiences in the region, were also taken into consideration for the risk analysis. The outcome was documented in a report that included specific recommendations aimed at lowering the risks to acceptable levels, and for the proper management by the Operator. The project consisted in completing an Environmental and Social Due Diligence in context of a business transaction and investment in the energy sector in the Dominican Republic. The facilities involved downstream fuels operations and assets, including a network of 142 retailing stations, consumer and industrial fuel distribution, aviation facilities at three international airports, and a truck-fleet of 21 units. HSE International was appointed by the International Finance Institution as the independent environmental, social, health and safety consultant to conduct the due diligence during the transaction. The approach of this consultancy focused on identifying and evaluating environmental, social, health and safety conditions, which could represent liabilities and risks – and to consider appropriate management and mitigation measures. The appraisal included reviewing the existing information and data including the Companies operation excellence and management systems, meetings and interviews with Company representatives, prioritizing assets to conduct field visits based on risk profiles, conducting site visits to representative assets and operations in country, carrying out interviews with the personnel of companies, and engaging with local stakeholders. The outcome consisted of risk ranking the sites, and a documented process and technical report summarizing key findings and risks, recommended actions and potential environmental liability associated with the sites assessed. The project consisted in completing an Environmental and Social Due Diligence in context of a business transaction, acquisition and investment in the energy sector in Haiti. The facilities include the largest network of gas stations in Haiti, with 58 service centers, the exclusive concession for distributing aviation gasoline at Haiti’s two principal airports, and the main fuel storage terminal in Port-au-Prince. HSE International was appointed by the International Financial Institution as the independent environmental, social, health and safety consultant to conduct the due diligence during the transaction. The approach of this consultancy focused on identifying and evaluating environmental, social, health and safety conditions, which could represent risks and liabilities – and to consider appropriate mitigation measures. The outcome consisted of a well-documented process and technical report summarizing key findings and risks, recommended actions and potential environmental liability associated with the sites assessed. HSE International’s Principal led Environmental, Social, Health and Safety integration efforts in Latin America following the merger of two major oil ad gas companies with operations in several countries, and the later acquisition of and independent oil and gas company. The process required consolidation and restructuring of the HSEQ & SD function, appraisals and due diligences to determine potential liabilities, risks and impacts of the new assets and properties and the required non-objections for final approval of transactions.